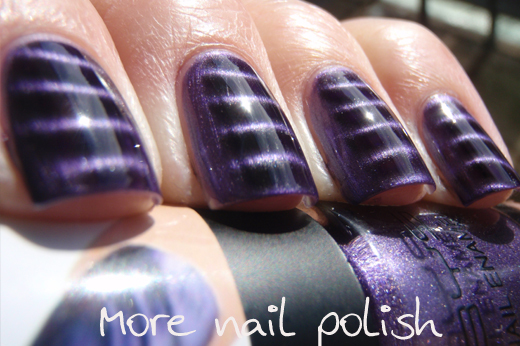 Aussie nail polish brand BYS recently released collection of magnetic polishes. I think there is nine polishes in the collection and I was send four of them to try out. Magnetic polishes have been huge this year, and just like crackled polishes last year, some of us might be getting a bit tired of magnetic polishes. I personally love them and I love having a full rainbow of colours to choose from. For all these photos I show two coats, the first applied without the magnet, the second with the magnet (thanks Captain Obvious!) All with one coat of Seche Vite. There are three magnet styles available (horizontal stripes, diagonal stripes and waves), and you can choose which style you want which which colour. I like that! Just about every other brand makes you buy a specific colour to get the magnet you want. Magnetic Cosmos - the base colour for this one is a rusty rose red. 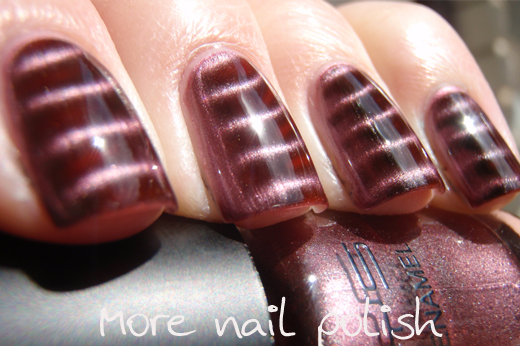 The magnetic pull is a dark vampy burgundy. The base colour is rather frosty looking and if it wasn't a magnetic polish it would keep showing brush strokes. But it is a magnetic polish and once you apply the magnet, any hint of frostiness disappears beneath the bloody red tones. This polish came with the waves design. I placed the magnet over my finger using the finger placer (which you can see in the last photo below), but you could of course turn the magnet and apply it at any angle. I'll go into a bit more detail about the magnets at the end. 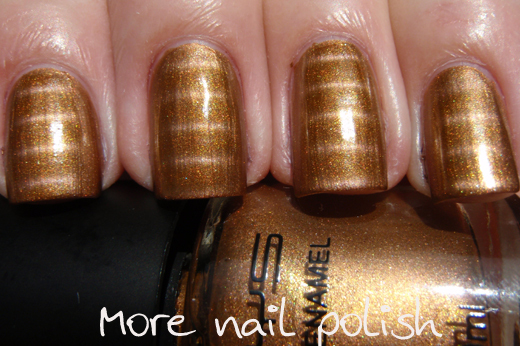 Magnetic Jupiter - this one is a tone on tone warm gold magnetic polish. 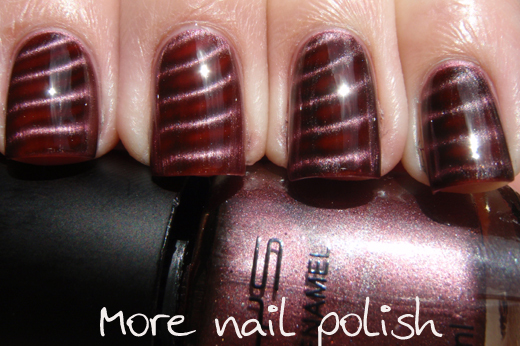 The magnetic colour shift in this one isn't as obvious as with the other polishes. It's not that the polish doesn't have a strong magnetic effect, because the design shows instantly, but more that this is a subtle colour difference. This one was supplied with the horizontal magnet. 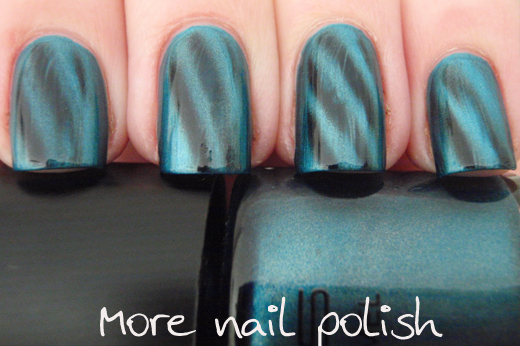 Magnetic Neptune - is a teal base with a blackened dark navy magnetic pull. I apologise for this swatch, I made a classic mistake while in 'automatic mode' of applying top coat immediately. 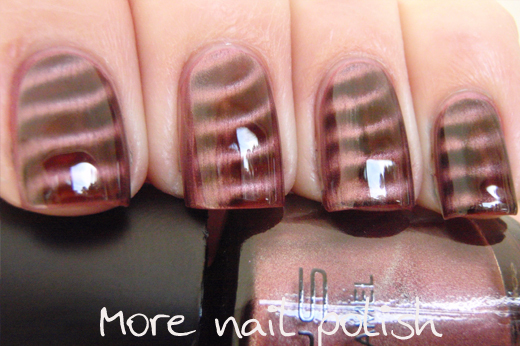 As you can see the brush strokes from the top coat pulled lines down over the magnetic design. Love this colour. It really reminds me of Layla Turquoise Wave, but at a much cheaper price point. This one was supplied with the diagonal magnet. 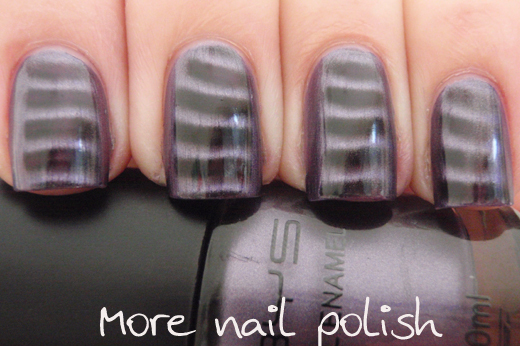 Magnetic Venus - here is the one for all you purple lovers out there. The base, like all the others, is a shimmery, nearly frosty, metallic, this time in a lilac purple. The magnetic pull colour is a blackened aubergine. This one was supplied with the wavy magnet. Here is a quick bottle shot. 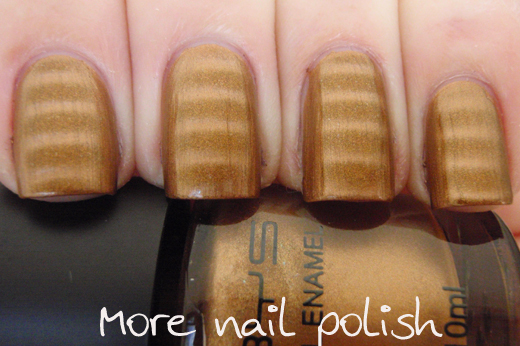 Unlike my other BYS polishes, this bottle is round not square. The cap pulls off so you can have easy access to the magnet which is in the top of the lid. Each magnetic design is very clearly printed on the magnet, with my only note being that the magnetic lines appear much closer together on your nail than they do on the printing. The wavy magnet is pictured below. There is also a little finger rest which I placed against my cuticle skin. The height of it was perfect. Close enough to pull a quick design, but not too close to touch it. My only wish is that the wavy magnet would have been a little bit bendier so you could really tell its wavy and not just crooked. I found the supplied magnets on each bottle were really strong. They pulled each design out very fast. 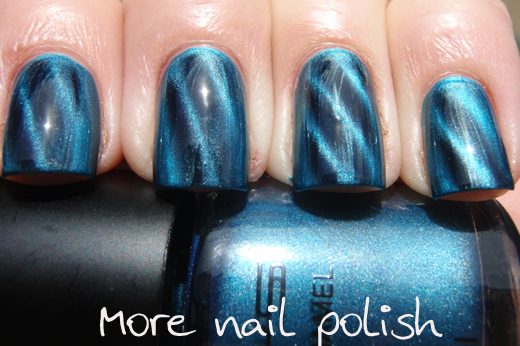 Three of the four polishes I received had really strong colour changes too. The formula on these was good, but definitely on the thick side. Painting my first coat was great and smooth, but as I do the second coat, I just put the brush back into the bottle and I don't screw it up so I can quickly apply the magnet. 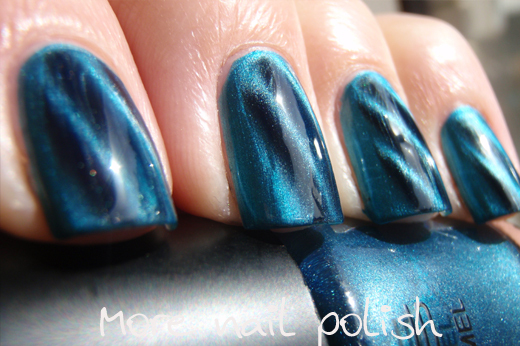 Because of this the polish tends to get thicker as you go along because it is essentially sitting there open. BYS might be a little bit late to the party with their magnetic line, but at least they have come out with a really good selection of colours and the quality of both the polishes and the magnets seems good. I'm still waiting to see muggles catch on to the magnetic crazy. I've not seen these in store yet, but you can buy them online from Fashion Addict. They are $6.95 individually and they have sets of three for $18.95. Free domestic shipping for orders over $40, no international shipping for nail polish. Great Job! 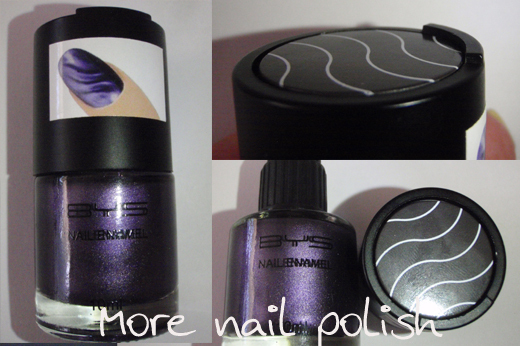 I love magnetic nail polish! These always fascinate me - such great effects with so little effort and people can't help but comment on my nails when I use them. I love magnetic polishes and I don't think I could get tired of them. I agree that there is a problem with some brands that you get specific magnet design only with specific colour and I don't want to buy colours I don't want in order to get pattern I like. 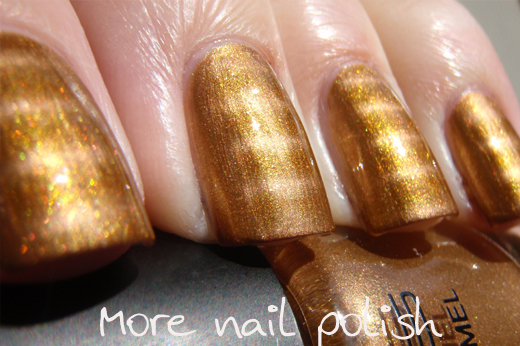 There are others that sell their polishes and magnets individually (Kiko, China Glaze, Essence) and there are those that have the same colour ranges for every magnet (Golden Rose), and I find that most often they only come just with stripy magnet. these look gorgeous! The colors look awfully similar to the Sally Hansen magnetics but I love the designs.. that first photo of Cosmos is just beautiful! Of course, I love Venus! :) They look awesome with such a strong magnetic effect!